TBS makeup brushes strike a good balance between quality and affordability (especially with their frequent sales), and they definitely are a favorite with me. The TBS Slanted brush is one of my more recent purchases. I rarely go without a liner along my lash line, and this angled eyeliner is perfect for a soft line with an eyeshadow or a pencil. Like all of The Body Shop makeup brushes, this too features soft, cruelty-free, synthetic fibers and can be used with powder as well as cream products. I find the TBS makeup brushes quite durable - my oldest ones are about 4 or 5 years old now without even the slightest bit of damage - and so far, I have found this slanted brush just as good. Scroll on for photos. Generally, angled eyeliner brushes are used for application along the lash line, and I find them slightly more forgiving than pointed/fine eyeliner brushes. Some also are good for filling in eyebrows in short, feathery strokes. 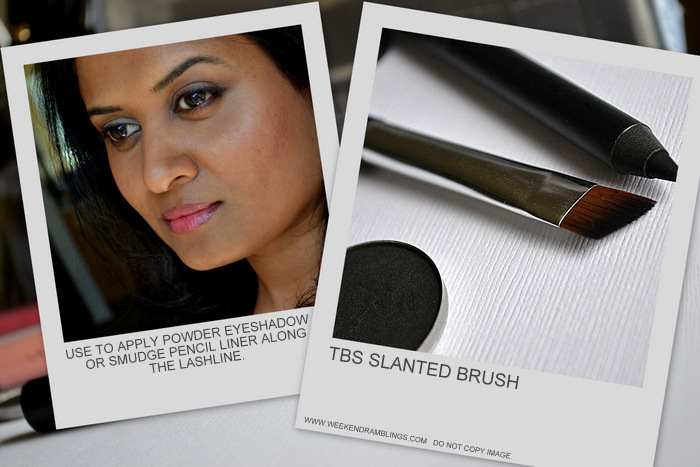 TBS angled brush has a slightly wider head and the brush fibers are longer and more flexible for use as an eyebrow filler brush ( which TBS recommends this for either). From the Body Shop website: Line the lower lashes using short, light sweeping strokes along the outer line of the eye, underneath the lower lashes. Use long, thick sweeping strokes to blend color over the eye. Apply Liquid Eyeliner to the end of the brush and lightly dab along the lash line. I use the TBS Slanted Eyeliner brush mainly with powder eye shadows, using the brush to press the shadow along the lashline. This brush can also be used for smudging pencil eyeliner along the lash line. I have never used this brush for a liquid liner - mostly because I do not use liquid liners and prefer a pointed brush for gel liners. The synthetic fibers on this brush are quite soft and never irritate the sensitive skin along my lashline. Caring for the brush is easy - I use a regular shampoo to wash and then lay the brush to dry overnight. While an angled eyeliner brush might not be the first makeup brush I would run out and buy, the TBS slanted eyeliener brush is definitely an essential in my regular makeup routine. Pick this up (especially during the sales) if you are looking for a dependable brush to add to you kit. Skip if you are looking for an eyebrow brush.